That wonderful book, which I treasure, included feline newborns, of course, but this book is exclusively feline. Check out the photos (Pages 116-121) of a somewhat scary looking -- but still cute -- melanistic or black Jaguar cub named Magala who calls the Bosphorus Zoo in Turkey his home. I first saw Jaguars at the wonderful, fun and educational Belize Zoo several miles from Belize City in the central American country when we lived there for several months in 2008. Melanistic jaguars represent about 6 percent of the elusive big cats, the third largest big cats after lions and tigers and the only big cats native to the Americas. Black jaguars are the same species as the spotted coat ones, and if you look closely (but be careful, they have the most powerful jaws of any feline! ), they have the same markings as spotted ones My chief reference on Jaguars -- and one of the reasons we decided to spend some time in Belize -- is Alan Rabinowitz's "Jaguar" (Arbor House, 1986). Rabinowtiz, an American, studied Jaguars in Belize and is credited with helping preserve the species. (For more on black jaguars in Belize, click on: http://biological-diversity.info/Black_Jaguar.htm). Cats are widely believed to hate water, but the fishing cats (Pages 20-23) of southeast Asia, including Thailand not only aren't scared of water but are experts in seizing prey in water, hence the name. Chet, Lek and Kiet, the fishing cats illustrated and described in this book, are cute beyond description! (You can tell I like cats!). They're at the Cincinnati Zoo and Botanical Garden. 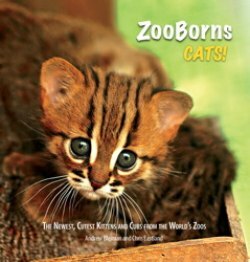 "ZooBorns Cats!" is a wonderful book for adults and young people alike, a book to treasure and read again and again. It's an important contribution to efforts to preserve endangered feline species throughout the world, including jaguars, Persian leopards and Amur leopards (pages 130-135). With only 30-35 individuals remaining in the wild, Amur leopards are critically endangered, making Tuffy, born in 2010 at the Jacksonville (FL) Zoo an important cat indeed. In sharp contrast to the disaster of the Zanesville Ohio man who haphazardly collected wild animals, accredited zoos and aquariums staffed by dedicated professionals are important in the preservation of animals like the ones in the "Zooborns" books. The books illustrate the connections between zoo births and conservation initiatives in the wild. Andrew Bleiman is a lifelong animal nerd who serves on the Auxiliary Boards of the Lincoln Park Zoo and Shedd Aquarium in Chicago. He also runs Zooillogix.com, a bizarre zoology news blog on the ScienceBlogs Network (a division of Seed Media). In his day job he develops new media strategy for the Bradford Group. Chris Eastland is a classically trained artist and photographer, who studied and taught at the Charles H. Cecil Studios in Florence, Italy, and now lives in Brooklyn. Chris was formerly the Photography Editor for Quest Magazine.